The 16th-century stained-glass windows in De Sint Janskerk (St John’s Church) in Gouda, South Holland are among the best post-medieval religious art in The Netherlands. 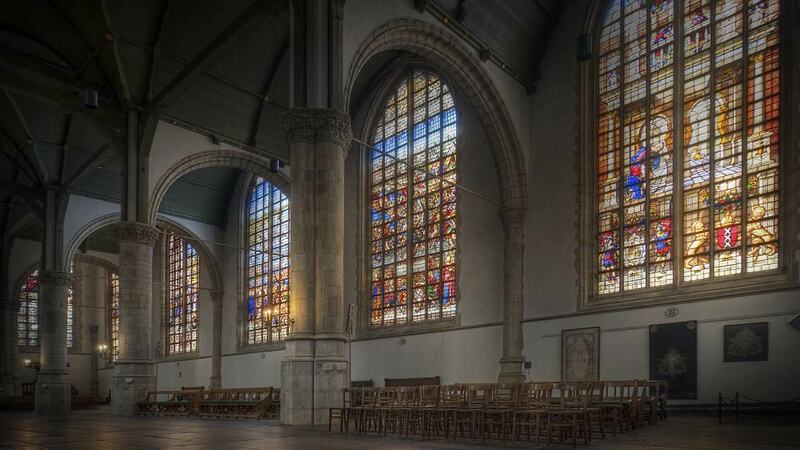 The Sint Janskerk (St John’s Church) in Gouda is the longest church in The Netherlands allowing for fine acoustics and enough space to display almost half of all sixteenth-century stained-glass windows that survived in The Netherlands. 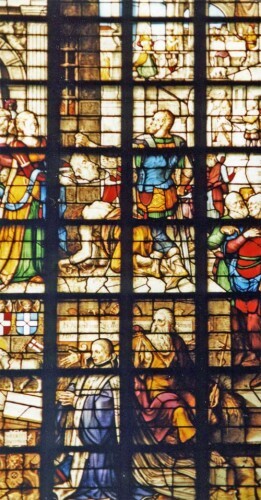 The Gouda Windows (Goudse Glazen) depicts scenes from the life of St John the Baptist, other biblical scenes, as well as important events in Dutch history. De Sint Janskerk in Gouda is a brick Gothic church that dates mostly from the sixteenth century. 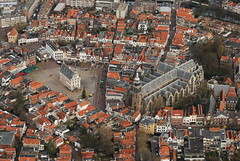 The first church was erected at this location in Gouda during the thirteenth century but the present church is mostly a conversion of a fifteenth-century church that was severely damaged following a lightning strike in 1552. De Sint Janskerk has at 123 m (404 ft) the longest nave of any church in The Netherlands. This length, combined with a relatively narrow 49 m (160 ft) width, contributes to the church’s fine acoustics and popularity as a concert venue. The total area of the church is an impressive 4,815 m² (52,000 sq ft), which allows for ample space for the magnificent stained-glass windows that provide the main attraction of the church. 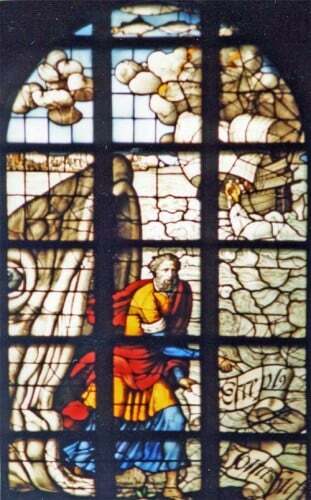 It is for the Gouda Windows (Goudse Glazen) that most visitors travel to the Sint Janskerk in South Holland. 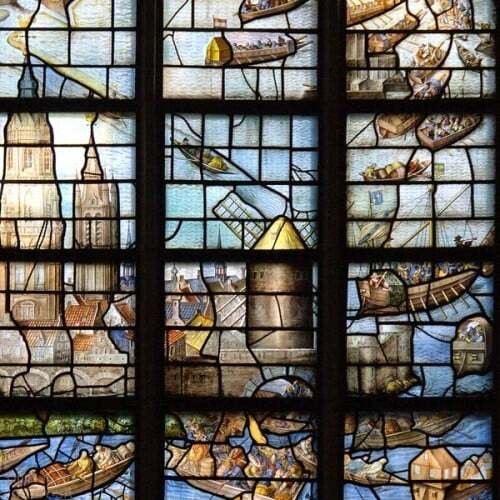 In contrast to the statues and many other decorations in the church, the windows survived the Reformation as well as several wars and upheavals to provide half of all sixteenth-century stained-glass windows that can still be seen in the Netherlands today. The main theme of the stained-glass windows in the choir of the Janskerk is the life of St John the Baptist, the patron saint of Gouda. Christ and the Twelve Apostles are depicted higher up in the center of the choir. A narrow passage leads from the back of the choir to the small Van der Vorm Chapel where the passion of Christ is depicted in stained-glass windows moved here during the 1930s from the Monastery of the Regulars. These windows are from the workshop of Dirck Crabeth. A wide variety of biblical scenes are depicted in the stained-glass windows in the nave of the Janskerk. Many of the windows here are by the brothers Wouter and Dirck Crabeth as well as other famous artists from the period. An interesting aspect of the stained-glass windows of the Sint Janskerk is that both Roman Catholic and Protestant themes and images are depicted in the same church. Many of the windows were completed in the period between the fire of 1552 and 1572 when the church was still used by the Roman Catholic community. 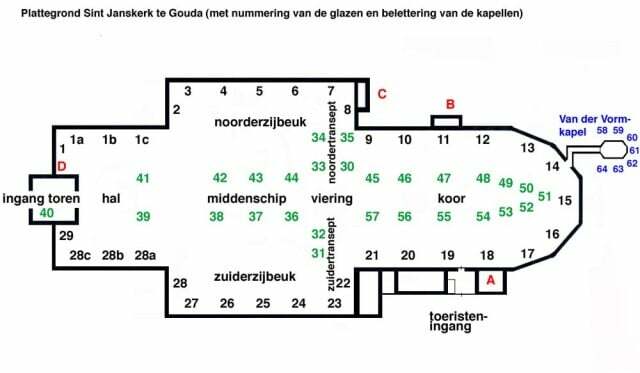 From 1572 onwards, the St Janskerk was the main church of the Protestant Dutch Reformed community in Gouda, which had the windows completed between 1594 and 1603. As was common during the sixteenth century, the donors were often honored in the lower parts of the windows either by depicting the donor in person, or by name and heraldic emblems. Thus it is possible to see in the stained-glass windows of the Sint Janskerk the Catholic kings of Spain, Mary Tudor, as well as the Protestant Willem van Oranje. 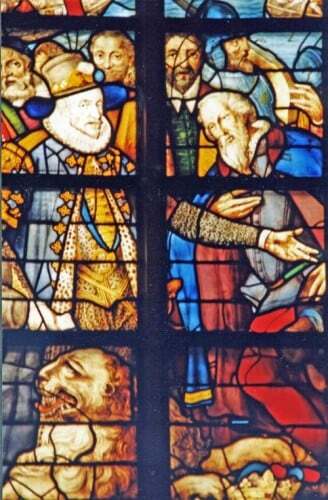 Purely secular scenes are also depicted in the stained-glass windows of Gouda. The Relief of Leyden (Het ontzet van Leiden) features William of Orange and the famous event from the Dutch-Spanish wars, while the Liberation Window (Het Bevrijdingsglas) commemorates the end of the Second World War. 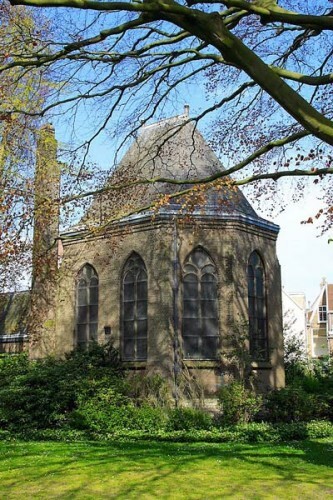 The Sint Janskerk is open to visitors Monday to Saturday from 9 am to 5 pm (10 am to 4 pm from November to March). The church is closed to tourists on Sunday and some public holidays. The Sint Janskerk is the top attraction of Gouda but visitors may enjoy other sights and outdoor cafés in the old town too. Across the road from the church is the entrance to the very interesting Gouda Museum (local history) – take at least a peak in the garden area, which is free. The museum has a display of the original up to 20-m tall cartons used for making the windows – it is the only complete collection of full-size cartons in existence for a 16th-century church. 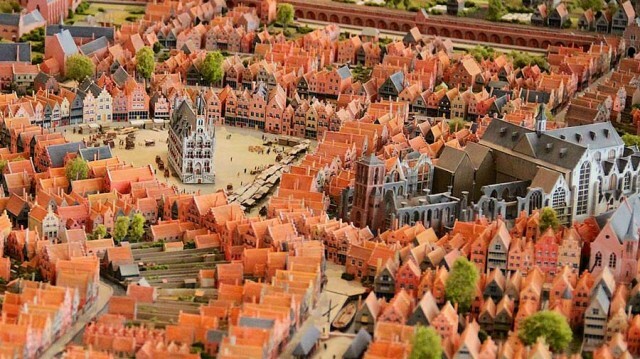 The large Gothic stadhuis (town hall) in the center of the Markt is also worth seeing inside. Don’t miss the cheese market held most Thursday morning from April to August. In complete contrast is the greenery of the peaceful Vogelpark Avifauna Bird Park, a few minutes’ drive from Gouda in Alphen aan den Rijn. Kinderdijk, with its famous windmills, are also within easy driving distance to the south of Gouda. If driving from Amsterdam or Schiphol Airport in the early morning, it is also worth seeing the Aalsmeer flower auction en route to Gouda.